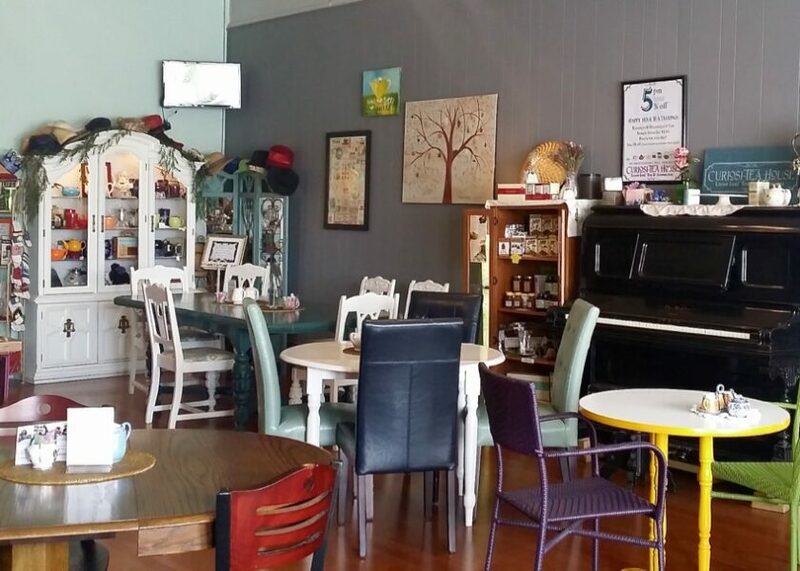 Mankato, MN is home to one of the recently named, “7 of the Most Charming Tea Houses in Minnesota”. 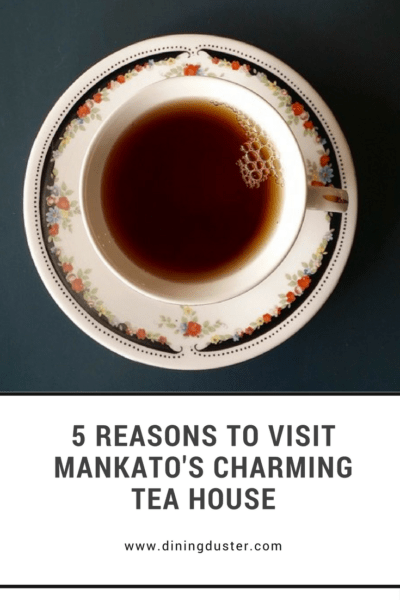 We’re going to give you 5 reasons to visit Mankato’s Charming Tea House for the ultimate charming, local experience! Last fall Dusty and I took a walking food tour in the Gold Coast neighborhood of Chicago. One of our stops was a tea shop. Our experience with good tea thus far was limited at best. We vowed then and there that we’d explore tea options going forward. How perfect for us to have this little gem right down the road from our house! 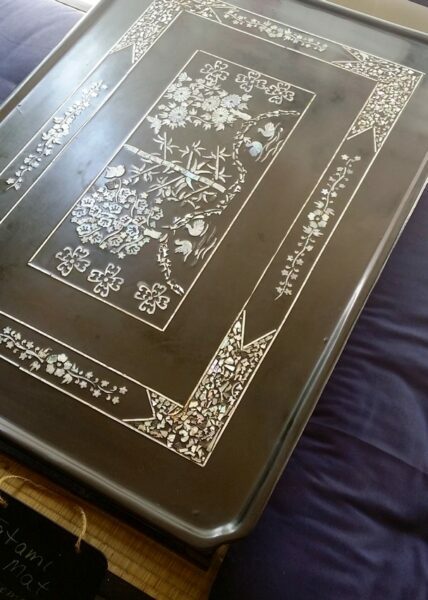 This metal sign was made by a local artist and greets customers at the side door of Curiosi-Tea House. Curiosi-Tea House is owned and operated by Heidi and her son. Heidi’s knowledge of tea will knock your socks off. She can recommend anything based on your likes. She has a wonderful sense of community and shopping local. For instance, she sources some baked goods from the bakery down the street, Friesen’s Famly Bakery. More on that below. If you’re looking to expand your tea collection then check out the monthly specials. They have bags as small as 3 ounces so it’s just a great way to taste something and perhaps buy a larger bag at another time. Their loose tea sample sizes range in cost from $1.50 – $3.25. This is another great way to try more teas but not commit to a larger bag. 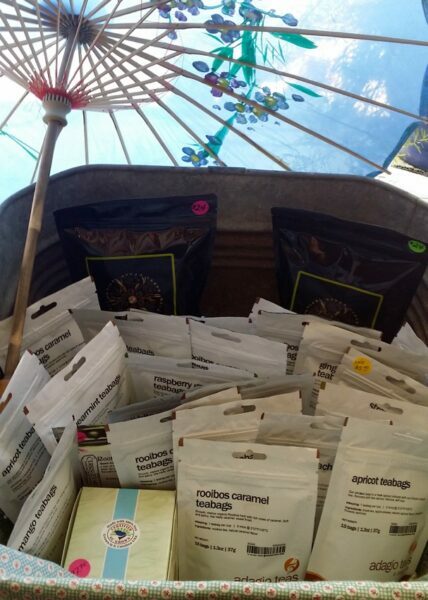 With over 150 varieties of loose leaf teas, you’re going to find something to enjoy! Tea lines include Adagio, Tea Source, Charleston Tea Plantation, Harney & Sons, Taylor’s, English Tea Store, and Nuwati Herbals. They’re available for in loose leaf or tisanes (herbal teas). Prices range from $3.25 – $20. 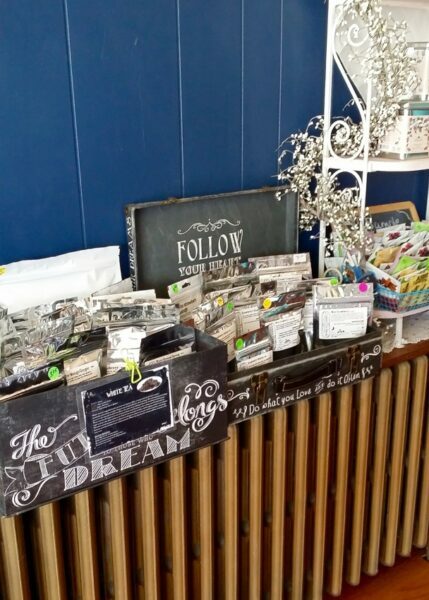 It’s a must to peruse the store because the tea for purchase is located in cute nooks & crannies all over the store. 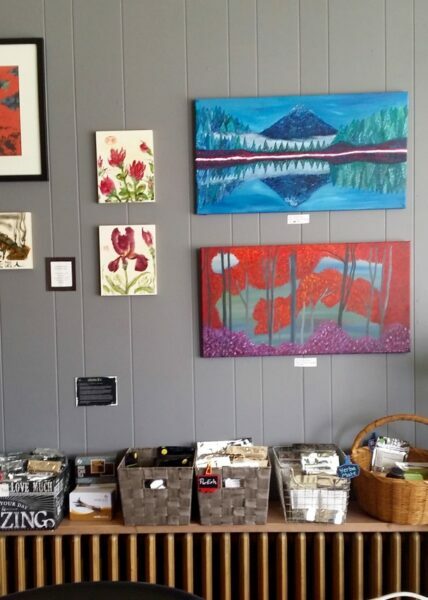 There is also artwork for sale by local artists. It’s always changing which is another reason to visit often! Twice weekly, there is an opportunity to have unlimited samples of 3 different teas for just $3.50 to taste 5 samples of tea! Also, if you make a purchase that night you receive a 5% discount the night of the happy hour. Currently, the Happy Hour Tea Tastings occur on Tuesday & Thursdays from 5-7pm. What a great way to unwind from the workday and regroup a bit with some lovely tea. If you like their Facebook Page they always post the tastings on their events tab. Also, they list the tea that will be sampled that will be sampled that evening. Similar to the Happy Hour Tastings on Tuesdays and Thursdays, there is also an opportunity to sit and relax with a Saturday Sampling. For just $3 you can enjoy unlimited samples from 10 – 11:30 am. Each time we’ve gone to a tasting there has been an additional opportunity to taste 2 more teas for just $.50 more! What a great way to try new teas to love or taste your favorites and kick off a wonderful weekend. Curiosi-Tea House also has a small kitchen and they offer baked goods, tea snacks as well as an Afternoon Tea Menu. Here is a link to their menu. For sandwiches, they use bread from the local bakery just down the road, Friesen’s Family Bakery They also carry a small selection of vegan meats & cheeses from The Herbivorous Butcher. There is also a selection of pre-made sandwiches using the vegan meats & cheeses that you can grab and go with or eat right there while you enjoy your tea. It’s awesome to have a local source for The Herbivorous Butcher products. Give it a try- you won’t believe how good it is! It truly is a charming spot to sit and enjoy some tea. 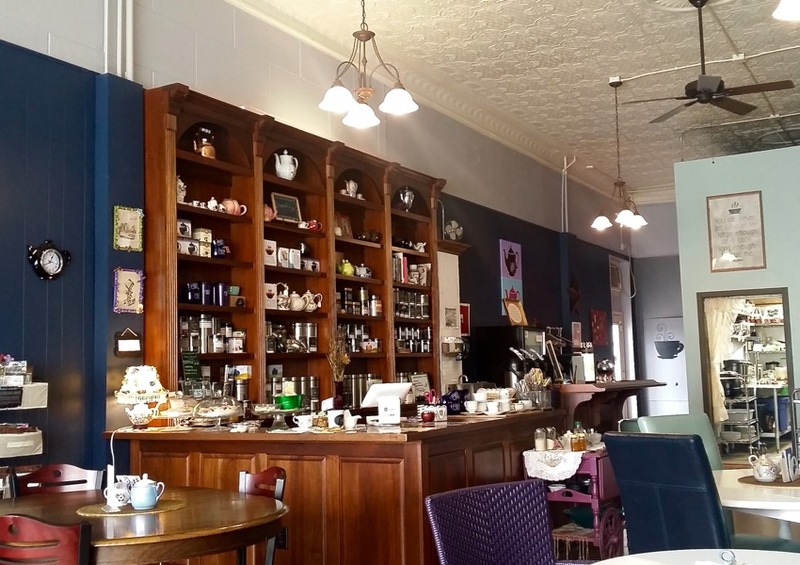 It’s no surprise to us that they were featured on the list of the 7 Most Charming Tea Rooms in Minnesota. Located in an old building in Old Town, a part of town that is going through a revitalizing transformation. The type of building with brick exterior and creaky, wooden floors and a beautiful, white ornamental ceiling. The room is eclectically filled with different sizes & shapes of tables and chairs. It’s a bit like sitting in a living room or dining room at someone’s home with a cozy atmosphere. There are racks, tables, and shelves scattered around the room filled with different teas for purchase. There are also many tea accessories to purchase. 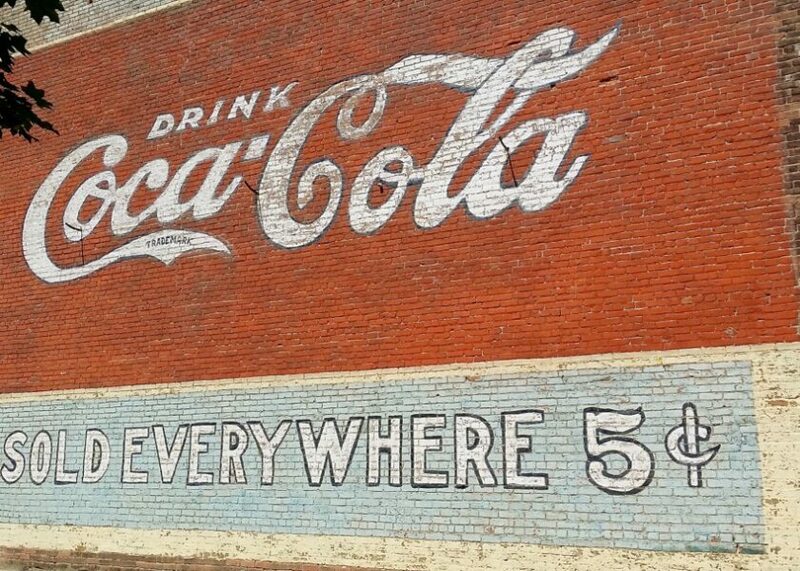 Here is a mural painted on the outside of the building. If you’re a tea lover or want to start exploring the world of teas, we highly suggest you stop in at Curiosi-Tea. There are some cute shops within walking distance to visit! 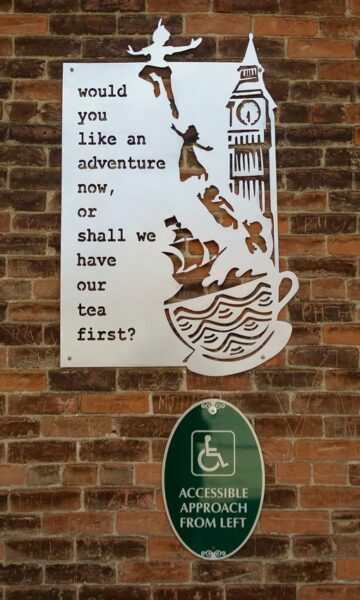 Drop a comment if you’ve been here or have a favorite tea house you can recommend to us! Pin this picture as a reminder to visit Curiosi-Tea House or find local spot for tea where you live! 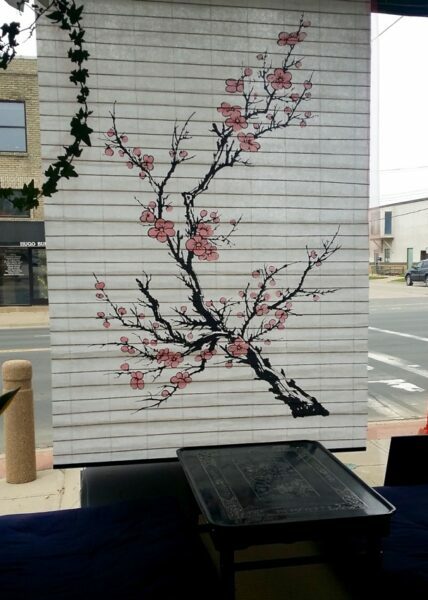 I’ve been wanting to visit a tea house for a while now… I’m adding this place to my list of places to visit in Mankato! Jenn- it’s so fun! I recommend visiting when you can sit and relax and really take it in! What a cool looking place! I LOVE tea and it’s so hard to find it for affordable prices! It’s such a nice place to sit and relax or to grab and go- I think you’d like it! Very affordable too. Looks like a great place! I have friends in Mankato, so I definitely need to share this post with them! Thanks, Nikole! Your friends should definitely check it out. Love this post and this place!! What a great idea for a post 😉 I hope you shared it with her!! Thanks, Greta! I did share it with Heidi. I’m moving to mankato in less than three weeks, so this post had PERFECT timing! I saw that they have open mic nights so I’m super excited to enjoy some tea and free entertainment! I think you’ll love it! Also a great coffee shop down the road with a nice menu as well. This sounds so lovely. I’m sold!